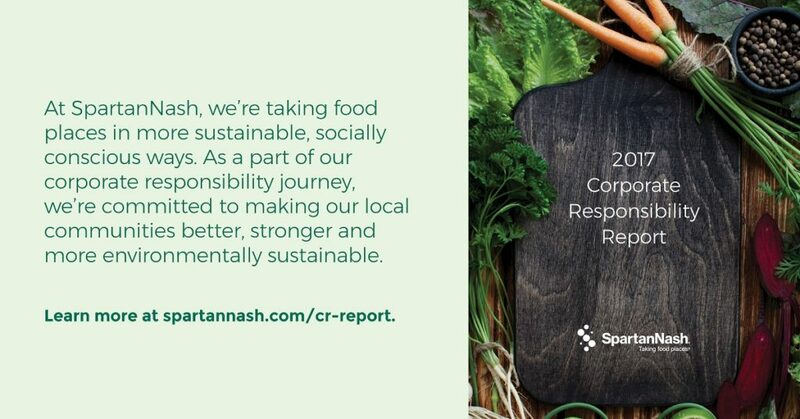 GRAND RAPIDS, Mich. – SpartanNash is proud to share its 2017 Corporate Responsibility Report, highlighting the ways the Fortune 400 company is taking food places in more sustainable, socially conscious ways. Through both stories and statistics, the report details SpartanNash’s corporate responsibility efforts in 2017, focusing on five areas defined by the company’s CR dashboard – cultivating local relationships and product development, advancing diversity and inclusion, volunteering, minimizing waste and reducing energy consumption. The full report can be found at spartannash.com/CR-Report. SpartanNash’s CR dashboard, which provides the company with a roadmap on how to sustain and scale its commitments. Nearly $1.5 million in corporate giving initiatives, including $174,000 through the Direct Your Dollars™ program. $1.5 million granted to more than 200 community nonprofit partners by the SpartanNash Foundation, providing hunger relief, securing shelter and supporting our military heroes. A commitment to working with local farmers and food producers to offer more than 2,300 locally grown and locally made items. Award-winning health and wellness initiatives, designed to equip SpartanNash associates and store guests with the knowledge and skills to eat and stay healthy. Volunteering efforts totaling 41,016 hours and $990,126 in economic impact. Diversity and inclusion initiatives to expand perspectives and drive innovation. Support of our servicemen and women through community sponsorships and veteran-friendly hiring efforts as they begin their civilian careers. 4 million pounds of product donated to community food pantries and local nonprofits. 9 million pounds of materials diverted from landfills through our recycling efforts. Efficiency improvements to its fleet of tractors and trailers, including improved miles per gallon, network optimization and solar panel technology. In 2017, 200,183 fewer gallons of diesel were consumed by SpartanNash’s fleet—reducing fuel emissions by 3.8 million pounds of carbon dioxide. A continued investment in energy efficiency and renewable sources of electricity, resulting in 1.4 million kilowatt hours saved. The report also includes a sneak peek at SpartanNash’s 2018 CR efforts, including real-time metric tracking to empower company leadership to own key corporate responsibility results and the creation of Sustainability Champions and Green Teams in each of its 19 distribution centers across the country. To exemplify its commitment to corporate responsibility, the 2017 Corporate Responsibility Report was printed in limited quantities using paper made from 100 percent post-consumer content, processed without chlorine, manufactured using renewable biogas and certified for reduced environmental impact by ECOLOGO. In addition, SpartanNash Graphic Services printed the report with soy-based inks. View the SpartanNash Corporate Responsibility Report at spartanash.com/CR-Report.